YOUR PET IS PART OF YOUR FAMILY. Your pet provides you with love and enjoyment every day, and you take good care of him or her. This is why we offer a large variety of pet items in our stores. Maximize your time by shopping for your family and your family pet in one shopping trip. 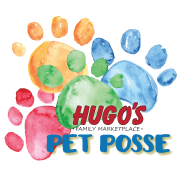 We want to reward you for choosing Hugo’s Family Marketplace for your pet supplies. Take advantage of our Pet Posse Reward program and save every time you shop for your pet. Once you have signed up for our Reach Offers E-coupon program, you will earn points every time you purchase pet related items. When you reach $150.00 in pet item purchases, you will receive an email the following Monday notifying you of your earned $10.00 reward. To use your reward, simply log into your account and “clip” the reward to add it to your virtual wallet. You can use your reward on your next shopping trip at Hugo’s by entering your phone number at the checkout lane.